The fundamental reason for widely different MPLS implementation is the first use case: Cisco IOS started with tag switching targeted at IP-over-ATM transport, where every IP prefix needs an end-to-end LSP; Junos started with layer-3 MPLS/VPNs, where you need LSPs only toward BGP next hops (or was it MPLS-TE? See the comments). CEF table and LDP database are combined to find outbound labels (labels assigned to IP prefixes by next-hop routers) that are then used in CEF table (FIB) and LFIB. The following diagram illustrates the protocols, data structures and their relationships. Some routing protocols still have their own data structures (OSPF or IS-IS topology database), others don't (BGP and RIP). 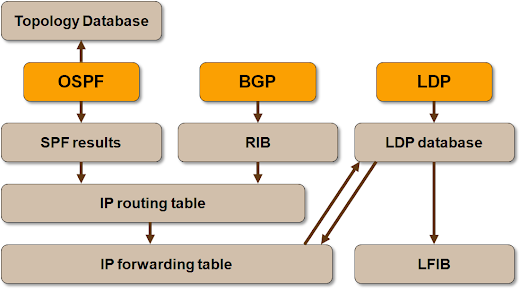 Local-to-next-hop label mappings are stored in Label Routing Table (mpls.0) and copied into Label Forwarding Table (LFIB). Finally, Junos uses the FEC mapping table to insert outbound labels into the IP routing table (not just FIB). The FEC mapping table is (by default) used only for BGP destinations. Traffic toward BGP next hop (for example, SNMP traffic sent to a PE-router’s loopback interface) is thus not labeled, traffic for BGP destinations using the same next hop is. If you enable MPLS (using the default settings) in a Cisco IOS-based network, every router generates labels for all non-BGP IP prefixes, and all the traffic is labeled by the first-hop routers. If you enable MPLS (yet again using default settings) in a Junos-based network, the routers generate labels only for the loopback interfaces, and label only the traffic sent toward BGP destinations reachable through loopback-based BGP next hops. Junos routers will label only IP traffic for BGP destinations. Yet again, remember that this section describes default behavior; you can change it on both Cisco IOS and Junos. FEC mapping table (inet.3) is much shorter than the IP routing table. It contains only the loopback addresses (the /32 prefixes), and an IP prefix for external BGP next hop that I added to LDP using egress-policy on R7 (the /30 prefix). Prefixes advertised by adjacent routers (R1, R2, R4 and R5) don’t have an outbound label (due to penultimate hop popping), R7’s loopback and EBGP next hop do. Local labels are created for all prefixes in inet.3 table; locally-originated prefixes don’t need labels; they are associated with label 3 (POP). LDP database contains all the information received from LDP neighbors or advertised to them; you can inspect the whole LDP database or entries received or sent to an individual neighbor. As expected, output label database contains labels for all entries in inet.3 table and label 3 (POP) for all locally-originated LDP prefixes. Last but definitely not least, let’s inspect the routing table entry for the external BGP next hop. You won’t find a label in this entry. Just to ensure there’s no other magic going on behind the scenes, let’s inspect the forwarding table entry for the same prefix. Yet again, no label. On the other hand, the routing table entry for a BGP destination using that same BGP next hop has two labels (because R3 can reach the EBGP next hop through two next-hop routers, R4 and R5. The outgoing label is also copied into the forwarding table. By default, Junos doesn’t perform load balancing toward BGP destinations; the forwarding table thus contains only a single outgoing label. I found your blog post very interesting. I think you may have missed a point in the history of MPLS and the differences in the approach of Cisco and Juniper as far as MPLS. I believe your history on the Cisco side is correct and that they were looking for a way to do switching through the network without doing an ip lookup at each hop and Cisco was pushing LDP as the standard for MPLS. I believe that Juniper’s first routers on the other hand were built on ASICs so they did not have the same constraints as Cisco on IP lookups. The thing that Juniper was trying to address with initial MPLS was a way to replace the TE capabilities that were present with ATM. I think ISPs wanted to do away with the ATM switches but still have Traffic Engineering capabilities. My understanding is this is the reason that Juniper was pushing RSVP as the standard of MPLS. Since in RSVP you have an LSP going to a single address the loopback of the remote device it makes sense to only have that single IP address associated with that LSP. I think that Junipers LDP behaviour is just applying their first implementation approach RSVP to what they implemented later in LDP. This is just a guess on the reason for the implementation difference but I know that Cisco pushed LDP and Juniper pushed RSVP at the standard when MPLS first came around. BTW, Cisco also had RSVP-based MPLS-TE very early on, but it took them a while to get the headend CB-SPF sorted out. These ones were actually made in PowerPoint (I dropped Visio years ago when Microsoft bought and bloated it). The hand-drawn ones make sense for simple things that I'll probably never reuse. It took me complete 24 hours to keep my head banging on the wall that why non BGP (infact I was not running BGP in my core at all) routes are not in mpls table of JUNOS and secondly why IGP learnt routes were not being labelled / tagged. No doubt, there is immeasurable gap between the knowledge base write ups of Juniper as compare to CISCO . Ivan - do you know if there's a way to make JUNOS load balance between inet.0 and inet.3? Unfortunately I don't know enough about Junos to answer this one. Vade, Why would you want to do that? Does configuring 'mpls traffic-engineering bgp-igp' not address your requirement? "IP traffic received by a Cisco IOS router will be labeled if at all possible (outbound label is entered in the FIB whenever there’s a corresponding mapping in LDP database)"
with MPLS enabled, Cisco normally uses labels to forward as soon as it receives labels from its LDP neighbors, if you want to have IP forwarding you have to disable LDP on egress (next-hop) interface. Is there a way you could have IP forwarding on an interface that is LDP enabled without having to disable LDP? You can control which prefix-to-label mappings are accepted with LDP filters, but (IIRC) once you accept a mapping from downstream neighbor, it goes into your FIB. Does this mean PE1 will only allocate a label for the loopback IP 1.1.1.1 and ignore any other IGP learned routes? Therefore the access-list 99 will contain the other PE routers (PE2,PE3...PE100) loopback IPs, but this does not scale very well assuming 100 PE routers, you will need a 100 entries in the access-list. Is there a way you can reference all /32 prefixes in a non-contagious IP block? Or what is the work around in this scenario? Can't see one, apart from automating stuff.